“Oh, what’s in a name?” Probably, this is the closest I’ll get to playing Shakespeare’s Juliet. Standing here, in a dress, above you on this pulpit. “Oh, what’s in a name?” Poor Juliet, alone on her balcony with all her teenage angst, overrun by hormones, pining for Romeo. “What’s in a name?” she asks. A great deal. A great deal is in a name, young Juliet. “Who do you say that I am?” asks Jesus. For once, Simon Peter gets it right. Peter understands Jesus‘ identity. He names the one before him. Messiah, and Son of the Living God, the power of that name. Others had names for Jesus as well. The pharisees saw him as an interloper, a pretender. The Romans saw an irritant, an enemy of the state, a protestor. How do we name? Who does the naming? Names are powerful. Names are powerful in the Gospel, and they are powerful in this story we have from Exodus. When we think of Exodus, we often hurry past this chapter. We all want to hear about Moses: Moses, the name of liberation. Think about the number of times you have heard that name, Moses. We still use the name to describe liberators “A modern day Moses” we hear. But before there was Moses there were the Hebrew midwives named Shiphrah and Puah. That we know their names is itself important. We don’t hear too many women’s names in the Hebrew Bible, and when we do they tend to be queens. These are the first career women we have named. The midwives, working women, Siphrah and Puah. We know their names. Shiphrah and Puah provide the context of liberation into which Moses is born. These wily midwives use Pharoah’s prejudice against him, and doing so save lives. Scholars have made the assertion, the midwives use Pharaoh’s prejudice against him. The story begins as a Pharaoh rises over Egypt, who “knew not Joseph.” That is to say, the relations between the people in power and the people of Israel have broken down. The Pharaoh who rises to reign does not remember the role a Hebrew person played in saving the people of Egypt. Pharaoh doesn’t know his history. Pharaoh has forgotten the relationship. And Pharaoh is afraid of them ah there is the name. The powerful name: “Them. The other.” Pharaoh names the people of Israel as other. “Let us deal shrewdly with them.” “Those people.” “The other.” “Them.” Make no mistake, “them” is a powerful name. She’s one of “them.” “Those people” they are multiplying too fast. They have too many babies. Pharaoh to his people, blame them. So Pharaoh summons Shiphrah and Puah, the midwives, and orders the death of the Hebrew boys. Pharaoh has named the Hebrew people “other,” and now we see the violence in that naming. By calling them them, by naming that distance, he de-humanizes the Hebrew people. He could never do this violence to “us.” Can we really imagine Pharaoh ordering, “kill our children?” Violence is done to those who have first been named them. We do violence to those we call other. Can you imagine Shiphrah and Puah listening to this order. Unable to believe their ears, but unable to express their disagreement, for fear of their lives, they try to hold their composure, and back out of the throne room. You see, Exodus tells us that Shiphrah and Puah “feared God.” That is to say, they knew that Pharaoh’s name for the Hebrew babies did not match reality. You have to watch out for vigorous women. They may be your salvation. Panel of Shiphrah and Puah from All Hallows Church Leeds, UK. Shiphrah and Puah play on pharaoh’s prejudice. The Hebrew women are not like the Egyptian women. The them are not like you. The midwives trick pharaoh by using his own false names against him. There is power in a name. Power to destroy and power to save. How do we use names? How have we been named? Identity politics is a phrase that has been thrown around a great deal in the last two weeks. There are politics in identity because there is a lot of power in a name. What names do we choose to use? These are questions of how we name. How do we choose to name? We have to choose the names we use for one another. The world we live in will give us a lot of names. “Oh, I can’t talk to her anymore, she’s a Republican.” “He doesn’t listen to reason, he listens to NPR.” We name one another all of the time, and the name beneath so many of those names? “Them.” “Not one of us.” Our baptism invites us to use a different set of names. Through time the Christian way has been an invitation to use a new set of names. “Sister.” “Brother.” “Neighbor.” “Friend.” “Beloved child of God.” I have come to believe that these names set us free from the blinders we have chosen for ourselves. The blinders of prejudice. The blinders of other-ing. I have come to believe that the names that our faith teaches us to use for one another help us to more fully see one another. The world’s names will still matter. Romeo and Juliet try to lose their names, only to tragically discover the power those names, Montague and Capulet continue to hold. I don’t believe we can forget the names our world uses. We can’t afford to lose the names we have been given. Tomorrow I head off to a conference for Latino/Hispanic ministry. The group could not agree on one of those names, Latino or Hispanic. I have friends who say, “I don’t speak Latin, why would I be called Latina?” I remember a friend in college who said, “I’m not HIS Panic. I’m not HER panic, I’m nobody’s panic.” Regardless, those are names with power. We can’t pretend they don’t exist. I am conscious as well, that as I name these names, I am a white man. I have been given the historical privilege. I can only talk so much of names of race, because I have not known prejudice directed toward me based on racial names. Navigating history’s names will never be easy. It shouldn’t be easy. These names come with history we need to acknowledge. We need to own up to the history. We need the names to remember. The names live on. These names describe a context in which we live. We need to learn how people have claimed these names. How names have been used both to tear down and to build up. Names are powerful. Identity matters. Yet, yet, knowing all of our names, to choose to name someone your social group calls “them” as “friend” strikes me as a particularly Christian project. Reaching out to the “other” to the “them” has been part of our Christian tradition since Jesus sat down at table with “sinners.” To explore the Christian tradition is to sit down at table with all the wrong people, and to name them your people. This is the invitation, and the challenge, at the heart of our journey together as a community. We have to name names. To be church, to build the community of Jesus, we need names for one another. Through the centuries we have called our fellow Christians, sister and brother, friend, co-laborer. To be a church is to choose a network of relationships, to call one another by new names. I spend a lot of time thinking about why people my age go to church. The Episcopal Church pays my salary to try to figure out how to get more young adults involved in Church. Too few are involved. Should we build churches just for people like me? I don’t think so. You see one of the biggest values of church, for me, is that I meet people who look and think and act so very differently from me. You all are pretty weird to me, and that’s great. You challenge me. You help me grow. We gather together across all sorts and categories of people. Rich, not so rich. Beautiful, not so beautiful. Women, men. Young, old, not so young, not so old. Black, white, brown. Gay. Straight. Not quite straight. English speaking, hispano-hablante, Cantonese speaking. Democrat, Green, Communist (yes, even Communist), Republican (yes, even Republican). We come together knowing well all the names the world has given to us. Several thousand years ago, a mad Pharaoh told Shiphrah and Puah to kill baby boys. They could not refuse outright, but they said with their defiant actions “we are not killing our sons.” Over and against the names of the world, they saw the value of those human lives. 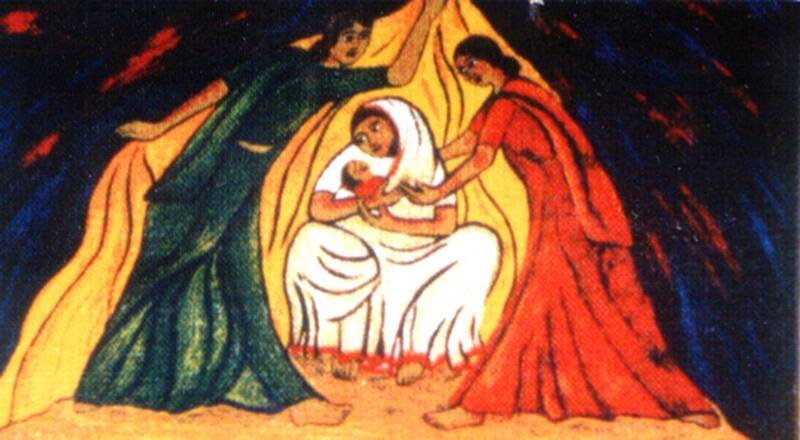 The midwives laid the groundwork for liberation. What names will we choose for one another? What names will you choose for yourself? Amidst the “other-ing” names of the world, can we choose the names “sister, brother, friend?” Can we dare to use the name “beloved child of God?” That is God’s invitation, to each and every one of us. That is what your baptism means. God chooses to name you, yes you. God says of each of you, “this is my beloved child. With this child, I am well pleased.” How well do we live that name? How do we help others hear that name? How will we choose to name? Will we be captivated by the names our world chooses, black and white, Jew and Arab, citizen and illegal, Republican and Democrat, Montague and Capulet? Or do we have the courage to hear God above the roaring name-calling? Can we call one another “sister and brother?” Can we see across the table and acknowledge our differences, own our disagreements, and still break bread together? I believe we can. I believe we can do that right here at Christ Church Cathedral. That’s why I show up. And we don’t even need a modern day Moses to show us how. We just need some vigorous women (and even some vigorous men). My sisters and brothers, we are invited to stand up in the midst of the name-calling. We can defy the pharaohs. We can save OUR children from the violence. We can. God calls us beloved. We are named “the beloved of God.” That is what’s in a name. What names will you choose? Reflections on Michael Brown rally, sharing stories, building trust.